General Electric (GE), an American multinational conglomerate which brings together the physical and digital worlds, today launched the “GE Leaders of Tomorrow” in a bid to develop future leaders. As a business comprising various technological inventions in industries such as aviation, power, renewable energy, transportation, oil and gas, and more; GE’s first student leadership program is designed to reach skilled and driven undergraduates from a variety of majors and academic backgrounds. The program acts as a platform which provides openings of a clear career guide with a minimum of one year ambassadorship, networking, special invitations to GE’s events and above all, a potential career at GE for the students. The pioneer program will identify students who will have opportunities to interact with industry leaders to discover their passion, exposure to real life experience which will enable them to develop key competencies and learn to inspire their peers. “At GE, we’re on the verge of an exciting new era. The marriage of software and industry will bring insights, efficiencies and innovations that we never could have imagined before which is in line with our mission to position GE as the company that will shape our future leaders. 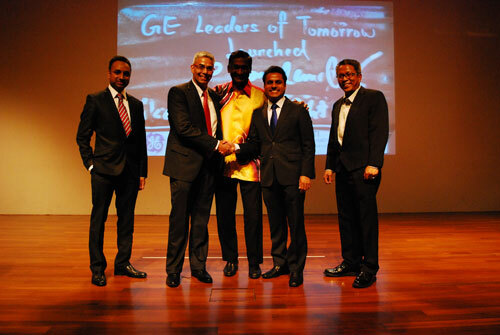 I look forward to connecting with our top five ‘GE Leaders of Tomorrow’ as we embark on this new mission.” said Vignesh Baboo, University Relations & Programs Leader – ASEAN for General Electric International. Earlier in April 2016, GE collaborated with INTI International University & Colleges and successfully kicked off this program by conducting promotional activities in the college. Over 90 INTI students were recruited to participate in the preliminary stage. Running from the 18th May 2016 to 9th June 2016, participants of the program were screened through three stages comprising of case study challenge, Corporate Social Responsibility (CSR) related task and other exciting games; with the main purpose of preparing students for the ever-challenging real business environment. 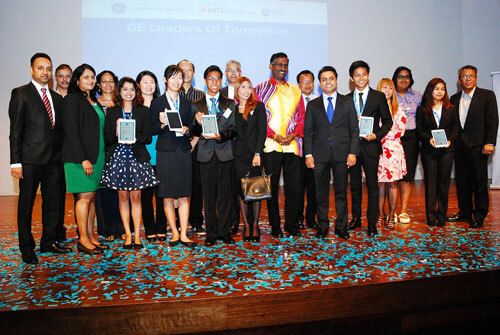 Through these stages, GE selected its top five student ambassadors from 20 finalists, who were awarded the coveted title and responsibilities of GE’s Leaders of Tomorrow at the official launch today. The top five winners were Kenrick Lim Soo Wen, Charmaine Sze Ka-Mei, Phareeshta Francesca and Asiffa Binti Mohammad Ali from the University of Wollongong (UOW) Bachelor of Commerce programme and Irfan Iskandar from the Cambridge A-Levels programme at INTI. This competition was a great experience for me because of the unexpected elements that were infused into each stage of the competition. The most exciting stage was the final one where we had to find an idiom that described something impossible; and using GE’s technology, we had to prove it possible. I chose a Chinese idiom, when loosely translated, describes ‘pan frying water to make ice’. Of course to make ice you would need a cooling element like a fridge, but using GE’s technology, we had to debunk that idiom. It was something so different and mind boggling. I truly enjoyed the experience and the exposure I gained from it,” said Charmaine Sze Ka-Mei, one of the GE Leaders of Tomorrow winners. “With the INTI Edge, students benefit from a quality education that includes international exposure, innovative learning and individual development. We have over 400 industry partners at the moment and GE is one of the key partners. With the GE Leaders of Tomorrow, our students have had the opportunity to gain international exposure as GE itself is a multinational organization involving in various industries worldwide,” says Rohit Sharma, Chief Executive Officer of INTI International University and Colleges.